Mylonite is a foliated metamorphic rock that is composed of intensely flattened minerals in a fine-grained streaked matrix. Mylonites form deep in the crust where temperature and pressure are high enough for the rocks to deform plastically (ductile deformation). 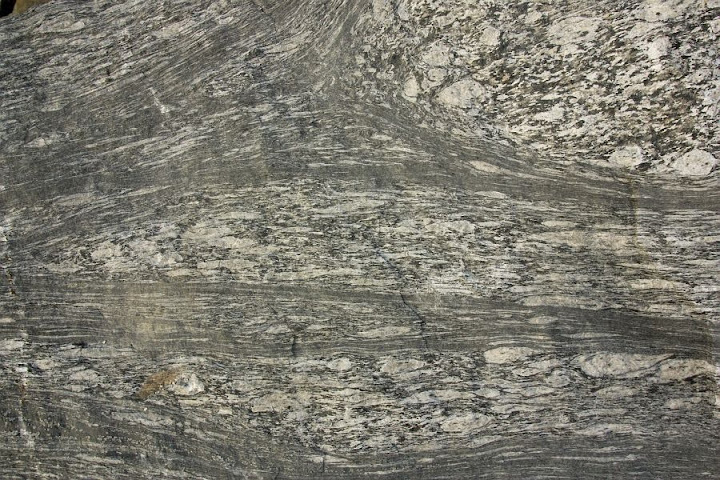 Mylonites form in shear zones where rocks are deformed because of the very high strain rate. Mylonites contain porphyroclasts. These are crystals that existed before the process of mylonitization began, but have survived with lots of strain damage. They are ovoidal or stretched and are surrounded by finer and even more deformed mineral grains. 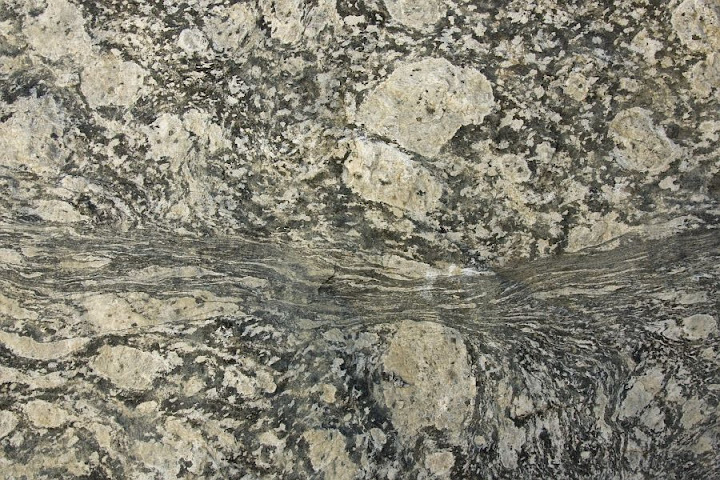 Mylonitic rocks with porphyroclasts are often described as having a flaser fabric. Mylonite is a fine-grained rock that containes intensely flattened minerals. A boulder on the coast of Varanger Peninsula in Norway. 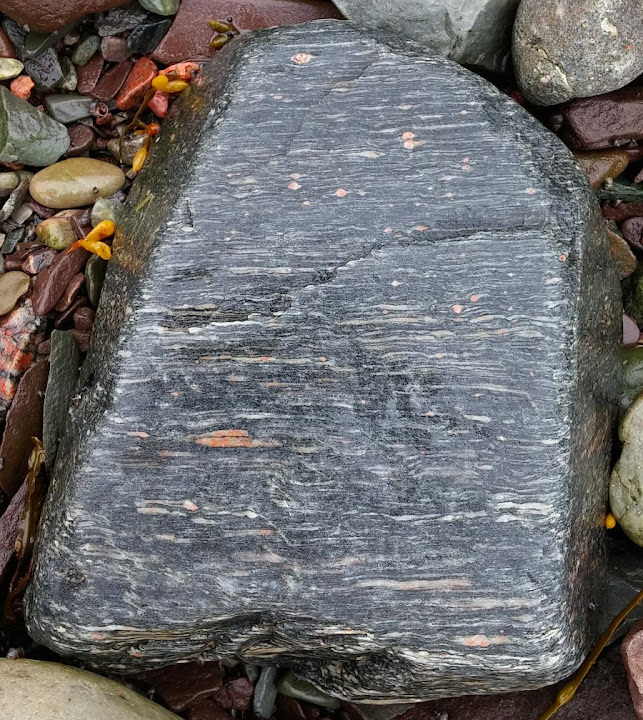 The rock is called protomylonite if the porphyroclasts make up more than half of the rock volume and ultramylonite if almost all the porphyroclasts are gone (less than 10% have survived). In the latter case the matrix grains are so small that the rock may even resemble chert. Mylonitic fabric forms as a result of both destructive and constructive processes. The first is responsible for the plastic deformation and the latter for the recrystallisation which gives an impression that the rock has been semi-molten and flowing under very heavy stress. 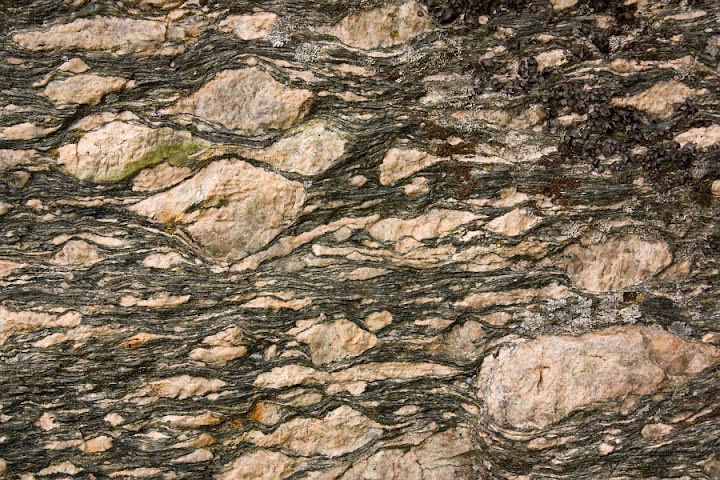 Mylonites may occur as thin sheets in relatively unmetamorphosed rocks (see the pictures below) or they may encompass broad zones several kilometers thick. ‘Mylonite’ as a term is not new. It was coined by Charles Lapworth in the late 1800s who described mylonitic rocks from the Moine thrust in Scotland. But the interpretation how these rocks were formed has changed. It was generally believed that mylonite is a result of intense brecciation (brittle pulverization). The name originates from the Greek language (mylon – to mill). Nowadays we believe that instead of milling mylonitization is a result of ductile deformation and the discovery of plate tectonics has given us a framework to understand where and how these rocks can form – deep in the crust where rocks are hot and there are movements between crustal blocks, but the rocks are too plastic to deform by faulting. The process higher in the upper crust where rocks are brittle is called cataclasis. That we can indeed describe as a certain type of brecciation that results in lots of broken rock fragments and generally increased volume of the fractured rock body because of induced voids between the fragments. The photos below are from western Norway near the small village of Flatraket. There is an igneous intrusion surrounded by gneisses and also eclogites here and there. Especially eclogites were the reason why I visited this part of Norway and I managed to get some really nice pictures which I hope to demonstrate in the near future. The igneous intrusion is composed of mangerite according to the Norwegian bedrock map4. Mangerite is an orthopyroxene-bearing monzonite, but in this case it seems to contain a little too much quartz and alkali feldspar which makes it actually quartz syenite. It may be completely inappropriate to use the term mangerite in this case because according to Lappin et. al.3 this rock contains clinopyroxene, not orthopyroxene. It turned out that the rock has a rapakivi texture. At least some orthoclase ovoids are surrounded by plagioclase rims – a texture very familiar to me as the type locality of these rocks is in southeastern Finland. Not far from my home. Here is a larger view with a hammer for scale. Something is going on here. The rock is clearly oriented and orthoclase porphyroclasts have tails (recrystallized mineral matter). The ovoids have even grown bigger which makes this rock a blastomylonite (recrystallization has increased the volume of porphyroclasts). and even more. Now we are really talking about heavily stretched rocks. But it gets much better. Here you can see more intensely mylonitized rock zones and relatively undeformed syenite. 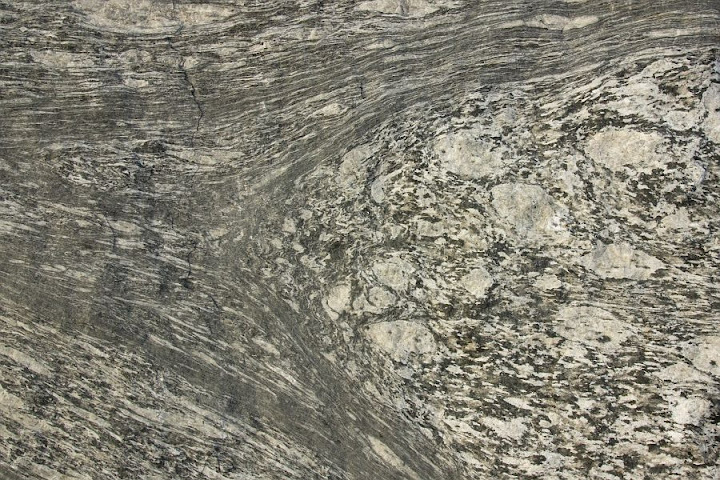 Some mylonite bands are so fine-grained that are approaching ultramylonite in appearance. Mylonitic zones may be only few centimeters in width. Another narrow band of mylonite within an almost unstrained igneous rock. And more ultramylonite (or approaching that) in the lower part of the deformed zone. Mylonite with large (largest is over 10 cm) K-feldspar porphyroclasts. Sør-Trøndelag, Norway. 1. Best, Myron G. (2002). Igneous and Metamorphic Petrology , 2nd Edition. Wiley-Blackwell. 2. Simpson, Carol (2007). Mylonite. In: McGraw Hill Encyclopedia of Science & Technology , 10th Edition. McGraw-Hill. Volume 11. 585-586. 3. Lappin, Michael A., Pidgeon, Robert T. & Van Breemen, Otto (1979). Geochronology of basal gneisses and mangerite syenites of Stadlandet, west Norway. Norsk Geologisk Tidsskrift. Vol. 59, pp. 161-181. 4. Bedrock map of Norway. I appreciate the care and expertise that went into this description of the mylonites.